As dawn broke on Monday 14th, and the Scots Guards completed the capture of Tumbledown, 2 Para on Wireless Ridge saw the Argentines streaming back to Stanley as the British artillery shelled their positions at will. The British forces now edged forward. Under Brigadier Thompson (pictured below at an earlier stage in the campaign), 2 Para moved off along the Stanley road followed later by 3 Para; 42 Cdo shortly flew forward from Mount Harriet and marched towards Stanley; and 45 Cdo yomped from Two Sisters for Sapper Hill. By nightfall all of 3 Cdo Bde was close to the capital. With 5th Infantry, the Gurkhas were ready to make a daylight attack on Mount William, but the Argentines disappeared and D Coy moved onto the summit that morning without any opposition. Meanwhile the Welsh Guards were delayed by minefields on their way to Sapper Hill, but then flew in with A and C Coys 40 Cdo to face slight enemy resistance just as 45 Cdo showed up. 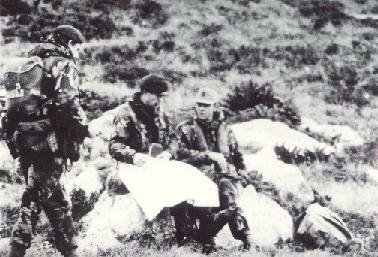 2 Para was the first unit to reach the outskirts, but halted as surrender negotiations got underway. These lasted for much of the day, and as they proceeded, British forces were ordered not to fire on the apparently demoralized enemy. However even now, General Menendez had 8,000 troops in the Stanley area including the largely intact 3rd, 6th and 25th Inf Regts, still well supplied with food and small arms ammo, but with little left for their remaining artillery and with all the high ground taken. Although ordered by Galtieri that morning to continue the fight, Menendez decided to negotiate, and a small British team led by Lt Col Rose of the SAS helicoptered in. A surrender document covering enemy forces both on West and East Falkland was agreed at the end of the afternoon, and that evening, General Moore flew to Stanley for the official signing. Timed to take effect from 9.00 pm local time, the actual signing took place at 9.30 pm or half an hour into the 15th, Zulu time. First into Stanley next morning was 2 Para, followed by 3 Para and 42 Cdo, whose men of J Coy, last there with NP 8901, later hoisted the Governor's flag over Government House. With 3 Cdo Bde staying in the Stanley area, most of 5th Infantry returned to Fitzroy, although the Gurkhas went to Goose Green where they later lost a man killed on battlefield clearance. With the surrender of the Argentines around Stanley, and their transfer to the airfield as a POW camp, steps were taken to deal with the forces on West Falkland and far away on Southern Thule. Still on Tuesday 15th, B Coy 40 Cdo crossed over to Port Howard by ship and helicopter to take the surrender of the 5th Inf Regt, and "Avenger's" Lynx landed a small party at Fox Bay to deal with the 8th Regt, after which all the POW's moved to San Carlos. To re-take Southern Thule in "Operation Keyhole", frigate "Yarmouth" and RFA "Olmeda" reached South Georgia from the TEZ on Thursday 17th to pick up men of M Coy 42 Cdo under the command of Capt Nunn RM, some of whom had already left with "Endurance" and tug "Salvageman". Arriving off the bleak shores on Saturday, "Endurance'" Wasp landed a small group near the Argentine base, and when "Yarmouth" arrived (with "Olmeda") to provide gunfire support on Sunday 20th June, the tiny remaining garrison on Southern Thule surrendered without a shot being fired. Needing food and shelter for his own men, a priority for General Moore was to ship home the POW's, with the exception of around 500 senior officers and technicians held as a guarantee against the junta fighting on. Both "Canberra" and "Norland" loaded a thousand POW's at San Carlos Water before heading for Stanley. There, "Canberra" took on board a further 3,000, leaving for Argentine on Friday 18th to be escorted into Puerto Madryn next day by destroyers "Santisima Trinidad" and "Comodoro Py". 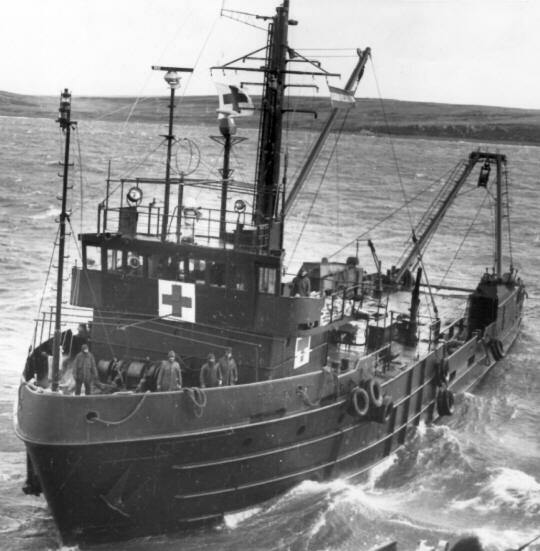 "Norland" sailed from Stanley on Friday with a total of 2,000 POW's to arrive off the same port two days later, and many of the remaining Argentines followed in the icebreaker "Bahia Paraiso". The "specials" returned on "St Edmund" a month later. Even with their losses during the fighting, the Argentines left behind considerable amounts of war material including artillery and armoured cars, missile and radar systems, and aircraft and helicopters in various states of repair, some of which returned to the UK for evaluation or integration into the Services. And apart from recovering the two Falkland's coasters "Forrest" and "Monsunen" for local duties, the Royal Navy took over two other small craft. As for the islands themselves, the British Government was committed to their defence in a policy referred to as "Fortress Falklands". If large and continuing expenditure and large, permanent garrisons were to be avoided, rapid reinforcement by air was vital. A first step came on the 24th June when an extended range Hercules landed at Stanley airfield. Then in October, after its lengthening and re-designation as RAF Stanley, the airport could be used by Phantom fighters. But that was still not enough. A major airfield and associated installations were therefore constructed near Pleasant Peak. Completed in 1985, Mount Pleasant airport is able to handle wide-bodied, long-range jet transports capable of reinforcing the Falklands at short notice.